Highlights: Biodiversity Centre (Thimphu), Botanical Park (Lamperi), Jigme Dorji Wangchuck National Park, Jigme Singye Wangchuck National Park, and Thrumshingla National Park. Visit the small Himalayan Kingdom that houses over 5,400 species of plants, including 300 species of medicinal plants, some species thriving even at 3,700m above. Explore the 369 species of orchids that Bhutan has, of which 82 are unique to the mountain country. See and feel the 46 species of rhododendrons in the country. Flight to Bhutan’s only international airport (2,250 meters elevation). After a short drive, hike to Taktsang Monastery (3,000 meters), famous religiously and for its location smack in the middle of a huge wall of cliff. Enroute see Bhutanese farms and meet people. Visit The Fortress of Victory (now in ruins) at Drukgyel, the National Museum, the Fortress on a Heap of Jewels (Paro Dzong), and the 7th century Kyichu Temple. Explore the vegetation in the valley towards late afternoon. Night halt at hotel in Paro. 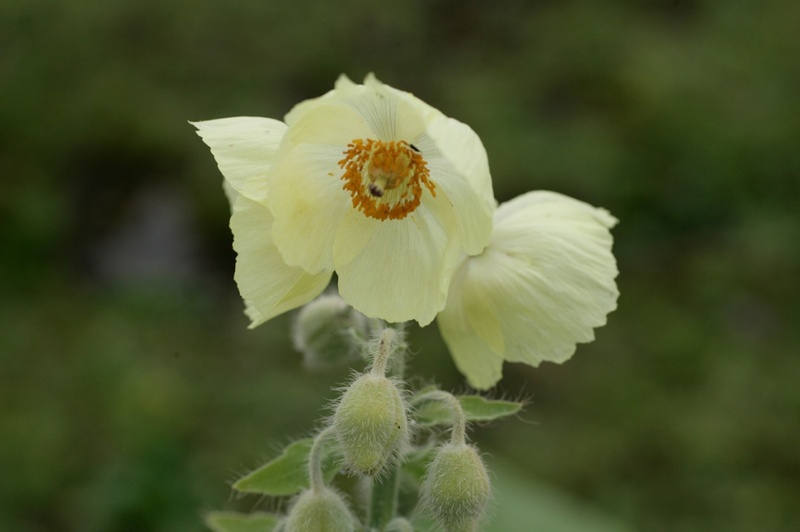 Drive to Chelela pass (3,810 m, over 12,000 ft) through a mixed forest of Rosa brunonii, Pieris formosaand Daphne papyracea and scour for aromatic herbs, meconopsis species and many primulas ( Smithiana, P. Denticulata, P. Sikkimensis). Chelela has an alpine ecosystem with several endangered and endemic species. Nearly all flora species found here are medicinal. Some rare species found are Meconopsis horidula, Meconopsis grandis, Fetillsria chirhosa, Aconitum Spp, Rhododendron anthopogon, Rhododendron nivale, Rhododendron setosum, Primula Species, Juniperus etc. The place is especially spectacular in the summer, when all the wildflowers are in full bloom. Night halt at hotel in Thimphu. Visit the National Institute of Traditional Medicine (NITM) in Kawajangsa, Thimphu, to learn about Bhutan’s art of making traditional medicine, in particular the hundreds of plants that are used as ingredients. See places of historical and cultural interest in and around Thimphu. Drive to Dochula (10,450 ft, or 3,100 meters), which provides a 360 degree panoramic view of the highest unclimbed mountains of the world. The place is considered a vitalconservation area with significant altitudinal and associated changes in vegetation within short distances. The east – facing slope harbors cool temperate broad – leaves forest at the higher elevation and Pinus roxburghii (chirpine) in lower elevations while the west facing slope consists of conifers from Abies densa(fir) and Juniperous recurva down to Pinus wallichiana (blue pine). A few kilometers away is the Lamperi Royal Botanical Park, which has 46 species of Rhododendron. The park also has trekking routes that lead into a cool moist forest of huge oak, magnolia and birch trees draped in moss that rings with the sound of birds and insects. The park is part of a 47-sq mile critical biological corridor connecting the Jigme Singye Wangchuck National Park and the Jigme Dorji Wangchuck National Park. It has cool broad leaf forests, mixed conifer forests, fir and sub-alpine forests and the temperate rain forest with hundreds of species of fauna. Some of the rare species found in the park are the monal pheasants, blood pheasants, musk deer, tiger, leopard, red panda and the leopard cat. Walk down an old trading route and witness a forest of Silk Cotton trees, Jacaranda and many tree ferns as we climb down to Punakha (4,160 ft) through paddy fields, farm houses, mountain brooks, and lush green landscapes. Visit places of historical and cultural interest in the Punakha-Wangduephodrang valley, including the spectacular fortress of Punakha, and the Temple of Divine Mad Man. Night halt at hotel in Punakha. We enter the Jigme Dorji Wangchuck National Park area where, among others, 55 orchid species (including Coelogyne corymbosa, Dendrobium nobileand Dendrobium perardi) have been found in the sub-tropical forests of the upper Mo Chu valley. We spend most of the day in the park and towards evening take a leisurely drive along the Punatsangchu river basin which is renowned as the habitat of one of the world’s most endangered bird, the White-Bellied Heron. We head to the east through the ruins of an impressive 17th century fortress, to a splendid landscape of alpine forests, meadows, and flowers, including different species of Rhododendrons, Legumes, Magnolia, Weeping Cypress (national tree of Bhutan), etc. Then we enter into the Phobjika valley (10,000 ft), the winter home of the rare black-necked cranes. We walk for two hour through scattered forest of red, pink and white rhododendrons (Rhododendron hodgsonii, keysii, R. kesangiae, R. ciliatum) to our lodge. Drive to Bumthang valley (200km) through Pelela Pass which ascends up to 3,340m and see wonderful view of Himalayan Mountains. The drive takes us through thick dwarf bamboo, Yak habitats, and Rhododendrons with beautiful hues of red, white, and yellow. See the spectacular Trongsa fortress, the ancestral palace home of Bhutan’s Kings. Also see the Watch Tower, and the town before driving to Bumthang valley across the Yotongla Pass. Drive to Ura valley, see the “Burning Lake” on the way, and stop enroute for various species of Rhododendrons, Rubus, Acer, Aconitum, Delphinium, Ranunculus, Clemantis, few species of orchid such as Coelogyne, Pleione, Cephalenthera, conifers such as Fir, Hemlock, Pine, Juniperus, Primulas, Androsac, etc. Drive further up to Thriumshing La National Park covering Bumthang, Lhuentse, Zhemgang, and Mongar districts. Bhutan has designated one area there as Insitu-Rhododendron Garden. The Garden showcases the Kingdom’s rhododendron diversity in theirnatural habitat in an area of approximately 2 hectares harboring 22 different species of rhododendron in assemblage. Thumshing La National Park is home to many endemic species namely Daphne ludlowii, Lobelia nubigena, Vanda griffithii, Rubus sengorensis, and Pedicularis spp. It is also has Red Panda, reptiles, amphibians and different avian fauna. Drive back to Bumthang and halt the night there. Undertake an hour-long hike to a local village. Drive to Paro International Airport for departure.